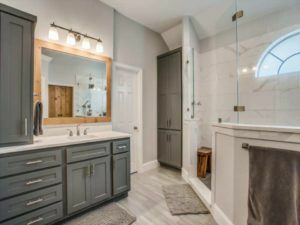 A bathroom remodel may seem like an exciting prospect, but many homeowners begin to question their decision when faced with reality. Budget and costs, material and layout decisions, limitations, and more can make the process stressful and less than desirable. However, if you go into your renovation project knowing what to expect, it will make the journey to your dream bathroom much smoother. What does the average bathroom remodel cost these days? That, of course, depends on the size of the project itself and the materials you choose to use. Cash – If you’ve saved for your remodel, work hard to meet your budget goals. Be upfront with your contractor and let them know how much you have to work with and how much you’d like to spend. Financing – There are several loan types that can fund your bathroom remodel. Take the time to talk to several companies to see where you can get the best rates. Two common options are home equity or personal loans. Need help financing your home improvement project? DFW Improved offers some great options for customers who prefer to finance their remodeling project, made possible by Greensky Financial. Be sure to leave a cushion in your budget to cover unforeseen costs, or for any special features that you may want to add in along the way. A good professional will work hard to avoid unexpected expenses and be transparent about how and where the money is spent. One of the biggest considerations in a bathroom remodel is a change of layout. You will, of course, spend less on plumbing and construction if you keep the existing floor plan. But the goal of a bathroom remodel is often to create more usable space; space that can easily be utilized by you and your family on a daily basis. Consider the flow and function of your already-existing layout and what you do and don’t like about it. Then, plan your new layout to function and flow in a way that truly works best for you. Changing the layout of your bathroom is one of the best ways to make your bathroom a relaxing place that you can enjoy spending time in. It is also one of the best ways to increase the value of your home. The more efficient the space, the more likely it is that future potential buyers can envision their lives in it. While it may be a bigger price tag up front, a new layout could be just what your dull and crowded bathroom needs to transform into an open and efficient space that you can use and love for years to come. An easy way to spend your money is by taking out your old fixtures and replacing them with new ones. New fixtures like your toilet, sinks, tub, shower, and other hardware, can chip away at your budget rather quickly. If necessary, one way to lower costs is to consider keeping some of your old fixtures. 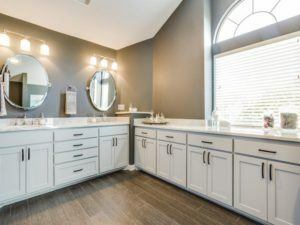 Some of the most expensive bathroom remodeling elements include the countertops, flooring, and other surface materials. Whether you are creating more room or just updating to give your space a fresh new look, these are the things that people often want to renovate the most. Choose materials that have the style you want and fit well within your budget. Bathroom elements like tubs and showers can quickly increase the amount of money you’re spending on your remodeling project. Choosing one over the other can have a big impact on the final price tag. Prioritize what is most important to you and see how it fits within your budget. Bathroom remodels can often be costly, but they also add a great deal of value to your home. For this reason, it is important to know what you’re getting into ahead of time. Make sure you talk to a professional remodeling contractor to be sure your renovations will give your home the added value you’re hoping for. In some cases, homeowners expect a significant increase in the value but realize too late that the type of work they are having done does not get them what they were expecting. Professional contractors will be able to provide the knowledge and insight you need to get you the best bang for your buck. It’s hard to say what the most important factors will be for each decision you make. A lot of that will depend on your personal situation. Those doing a bathroom remodel should have a list of must-have features that they absolutely want in their space. What does that look like for you? A separate space for the toilet, a shower, bathtub, a shower and a bathtub, heated floors, cabinet space, or even something unique like a steam room? List things you want from highest to lowest priority. As you navigate through the remodeling process, be willing to bend and let go of lesser-desired features if necessary. 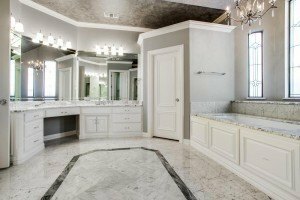 Here are some of the top things for you to consider when remodeling your bathroom. When choosing the components of your bathroom, keep the size and scale in perspective. 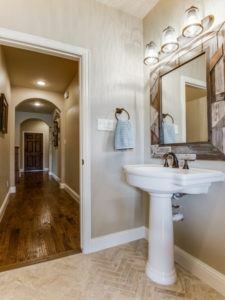 For a powder bathroom or a bathroom with a smaller layout, you may want to choose features that leave more floor space and don’t take up too much of the already limited room. Add in a pedestal sink instead of a cabinet sink to help open it up and make it seem larger. If your desire is to have more space overall, consider adding on to your already-existing layout. Extending your bathroom by even a couple of feet can not only get you the space you need, but it also increases the value of your home, making it more efficient and desirable to potential buyers. If your master bathroom has too much open, unused space, try adding a stand-alone tub or a vanity to help fill it in. Should you ever find yourself stuck on what works best, seek the helpful advice of an expert. Professional contractors, interior designers, and even realtors have an eye for what is most efficient in various spaces. These days, sustainability and age-in-place capabilities are rising in popularity. Homeowners like the thought of saving money with efficient products. And as the cost to retire increases, people are desiring to stay in their homes as long as possible. When designing your new bathroom, consider what will benefit you long-term. Perhaps creating an ADA compliant bathroom will let you stay in your home. Or maybe a low-flush toilet will save you markedly over the next decade. 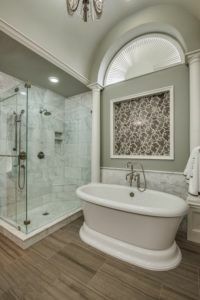 Adding things like ceiling-high cabinets or steps leading up to your bathtub may not be the most efficient or practical design features later on down the road. The key is designing for your needs both now and in the future. While it’s your decision to design your bathroom the way you want it, for aesthetics and resale purposes, it’s often wise for your design to be consistent with the style of your home. But that doesn’t mean that you can’t modernize it. 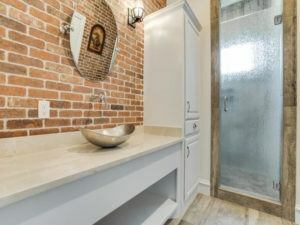 If you have an older craftsman, for example, consider adding modernized vintage touches like subway tiles and a standalone tub. These days, it’s easy to find new twists on these old favorites so that you can ensure you uphold the charm of your home while creating a space that is new and inviting to future buyers. Take some time to do your research and gather ideas. Look for fixtures, features and design elements that fit your style and preferences. Having some information and details ready to provide the architect and/or contractor will make their job that much easier. There was a time when lighting was forgotten, which created rooms people didn’t love. Luckily, times have changed, and lighting has become a primary focus yet again. Considering all that you use them for, bathrooms are an ideal place for good lighting. When choosing the right lighting for your new bathroom, think about your general needs within the space. Without it, the beautiful changes you’ve just made could still end up leaving you unhappy with your space. When it comes to your bathroom, storage is key. From cleaning products, cosmetics and toilet paper, to towels, medicine and kids bath toys, your bathroom is home to a wide variety of products that can quickly make it feel overwhelming and unloved. The last thing you want is to have your bathroom counters over-crowded every time you walk in. Consider adding storage options such as cabinets, vanities, and shelves to provide some added space to store all of your bathroom essentials. A lot goes unseen in a bathroom, which is why plumbing is so important. If your house is older, consider optimizing your pipes. With everything that travels through the plumbing, you’ll want to ensure you have proper sizing and placement. This could save you the huge hassle of having damaged pipes later on. If you’re already doing a remodel, it’s an excellent time to upgrade – and often well worth the cost. Choosing the contractors you’ll work with may be the biggest consideration you have to make when planning a bathroom remodel. You’ll want to work with someone who sees your vision, can assist you in fine-tuning it, and can perform the job in a way that turns that vision into reality. Transparency and reputation are two key factors to look for in your professional contractors. Look for people who are willing and able to answer your questions and have made a good name for themselves within the community. When you first meet with potential contractors and architects, don’t be afraid to bring your ideas and any questions you have. When the fit is right, you’ll know. A bathroom remodel can either be extremely exciting or dreadfully stressful. Yes, there are a lot of decisions to make. But walking into the project informed and aware of what you can expect can help smooth out the potentially bumpy ride. Before you start renovating, take the time to ask questions, do your research and plan ahead. That way when it’s time to start, you’ll be ready to go. Download our free Bathroom Remodel Planning Worksheet to help you stay on track during your next bathroom remodeling project!